Community Radio project a success! Long time supporter of the Silver FM Radio project Councillor Mark Watkin popped in for a chat ON AIR and to show his support for the radio station. 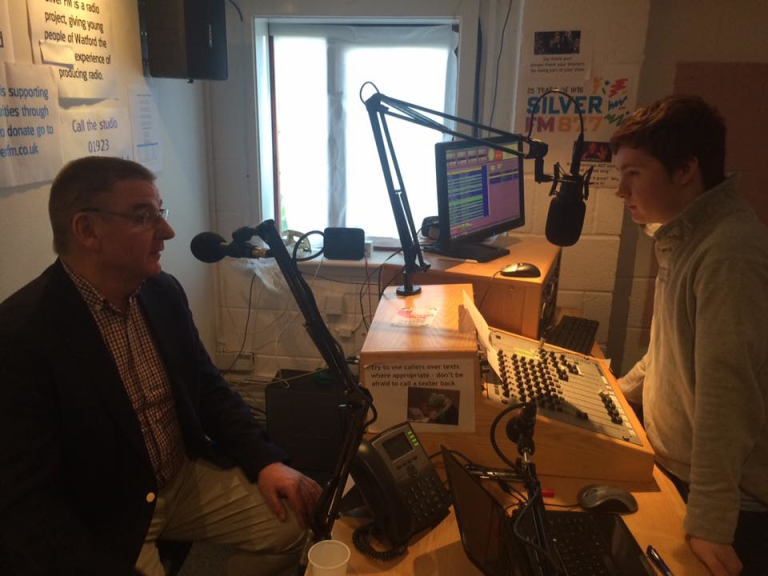 Volunteer & Student Callum Hewiston (who attends Francis Combe Academy) had the opportunity to interview the Councillor on the air. David Rees, Project Manager, said “Mark has been a leading light for the Silver FM project, he has supported our team, both with advice and a financial contribution too for which we are incredibly grateful. Mark completely grasped the concept of getting young people to broadcast on the airwaves, and he could see the benefits from the outset. And whilst Callum was nervous before he interviewed Mark, he did comment that even Councillors are friendly, and that Mark made it easy for him. An experience which Callum may not have had the opportunity without the station”. Silver FM was deemed a success, and the team behind Silver FM will be meeting for a debrief in the coming weeks to decide upon the next chapter for the charity radio project. To give children a dynamic and social learning experience and to participate in their local community.